This is the first comprehensive study of Babylonian prayers dedicated to Marduk, the god of Babylon, since J. Hehn’s essay “Hymnen und Gebete an Marduk” (1905). Marduk was the god of the city of Babylon and was the most important god in Babylonia from the time of Hammurabi (the 18th century BCE) onwards. 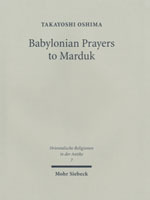 In this book, Takayoshi Oshima presents an up-to-date catalog of all known Babylonian prayers dedicated to Marduk from different historical periods and offers critical editions of 31 ancient texts based on newly identified manuscripts and a collation of the previously published manuscripts. The author also discusses various aspects of Akkadian prayers to different deities and the ancient belief in the mechanism of punishment and redemption by Marduk.